My garage definately aint the one ya wanna go in with a dangle-over. Last night was making some new gongs (they get slipped over some rebar at 200y). Well, actually they started out life as airliner life raft CO2 bottles. Got them from a friend. 'Bout 18" long, 4" diameter, and, they were full. Chained them down in my vice, got a draw-string hooked up, stood back and yanked. Huge cloud of CO2, big noise like a Saturn 5, did it 3 times in a row and the garage got nice and cool for a few too. Neighbors came out to see WTH it was. Told them I was discharging fire extinguishers to have them overhauled. One guy said he aint NEVER herd no extinguisher that loud as he walked off shaking his head. Then the cops came. What is this!??! Episode 2 continued next week? "Then the cops came." WHAT!! Remember...I'm old and have a short attention span. Could lose interest in this any moment now. They left when they knew it was me. One guy there calls me "Tool Time", always something going on in there. Vince's hangover. And what happened when the coppers came. This guy makes the BEST cowboy coffee. I mean really good. Darn near wake the dead! You'd be all over it, Bushy. 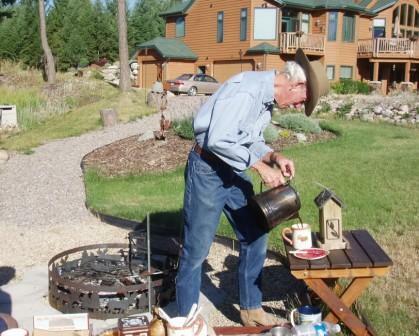 This guy makes the BEST cowboy coffee. Ok, since we are off topic, how about more info on this picture. At first I thought it might have been Bushy but its the wrong color cowboy boots and I noticed how good looking this gent was ... Doesn't look like California. Was this in Montana while you were on vacation? Hair's WAY too short fer Bushy. Yepper- last years vacation. Went to a buddy's house for cowboy coffee- oh man is it GOOD, homemade pie etc before heading up to Big Mtn for some zip-line action. That's debateable. And yer coffee? Well, it'll do in a pinch, I guess. Lemme know when the horse shoe's floatin', sir. I wonder if you COULD deal with my "camp coffee". I don't use a coffee pot. I just boil water and toss the grounds in and let it steep. Couple of egge shell pieces to settle the grounds and drink.